Over the course of the last few years, the health of the UK honey bee population has been subject of concern. Poor weather, the loss of habitat, the destruction of bee colonies by the parasitic varroa mite and the uncertainty regarding the impact of pesticides have all affected the honey bee. Very recently, honey bees have also been subject to an invasion by the Asian hornet. But why does this matter, and why are honey bees so important to nature? Perhaps the most important reason is because bees are pollinators that are absolutely vital to our food chain. one third of the food we eat would not be available to us, were it not for pollinators, of which honey bees are the most prolific. 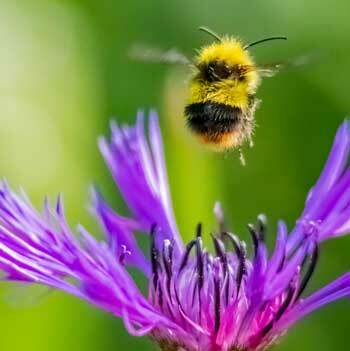 In the UK, about 70 crops rely on, or benefit from pollination. Although there are thousands of different, important types of pollinators in the insect world, the honey bee is unique in providing us with honey and products of the hive. It is the only managed insect on earth and as such is vital to our food chain, and quite possibly our wider health on this planet. Whatever the size of your garden, or window box, everyone can do their bit to help the honey bee by planting bee-friendly flowers and shrubs. As the nights draw in and temperatures dip, this is the time to think about how you can make sure that your garden is ready to help honey bees when they emerge hungry from the hive on milder days. In autumn, garden centres and supermarkets stock a range of spring bulbs. Make sure you plant them as soon as you can to take advantage of the soil’s warmth before the frost sets in. It’s a good idea to make snowdrops and crocuses part of your selection because not only will their early flower lift your spirits after the winter, but they provide pollen for bees that leave the hive on milder days in late January and early February. To help bees during the autumn months, avoid cutting back ivy. It is one of the only sources of pollen for bees in the autumn so keeping some intact helps the bees stock up on food before the winter. Also, Christmas rose flowers throughout the winter and has a wonderful scent to attract pollinators. In early spring, the bees are in a period of population growth which demands considerable amounts of food; however, there are not yet ample amounts of food available from flowering plants. the colonies will be consuming the last of their honey stores from the winter, and while adult bees can live on high energy carbohydrates in stored honey, developing bees must have a diet that includes pollen. At this time, they need a really good food supply, so early shrubs such as Skimmia are a good idea to plant. For thousands of years honey has been used for treating wounds. Dr Nural Cokcetin from the University of Technology in Sydney, Australia has been studying the medicinal properties of honey for ten years. She has conclusively found bacteria and some superbugs are unable to resist the medicinal properties of honey. The pH of honey is commonly between 3.2 and 4.5 and this acidic pH level prevents the growth of many bacteria. Honey is also primarily a saturated mixture of two monosaccharides. This sugar mixture has a low water activity. Most of the water molecules are associated with the sugars and few remain available for microorganisms, so it creates a poor environment for their growth – reducing the chance of infection. Research into the healing properties of honey has led to a variety of plasters and gauzes now using honey in its products. For people who want to learn more about beekeeping, or to help the honey bee in other ways, the BBKA has its Adopt a Beehive scheme where members of the public can adopt a beehive from one of ten different regions in the UK, including Val in Yorkshire. It costs £36 to Adopt a Beehive for one year, and in exchange you receive a welcome box of bee-related goodies, as well as updates throughout the year from your beehive and beekeeper. All the profits from the scheme are ploughed into environmental and education projects to help save the honey bee.